Happy Thanksgiving everyone! I just sat down for the first time in 4 1/2 hours, as I’ve been cooking and baking since I woke up. I just took a Salted Caramel Apple Pie out of the oven, and there’s a dish of Sweet Potato Casserole all ready for tomorrow in the fridge. Yes, the kitchen looked like a war zone for a while there… But it’s all cleaned up now! Anyway, what have you been up to this morning? I’d love to hear what you all are planning on whipping up for tomorrow. If you’re still in search for a seasonal treat that’s crowd and kid friendly, you’re in luck! 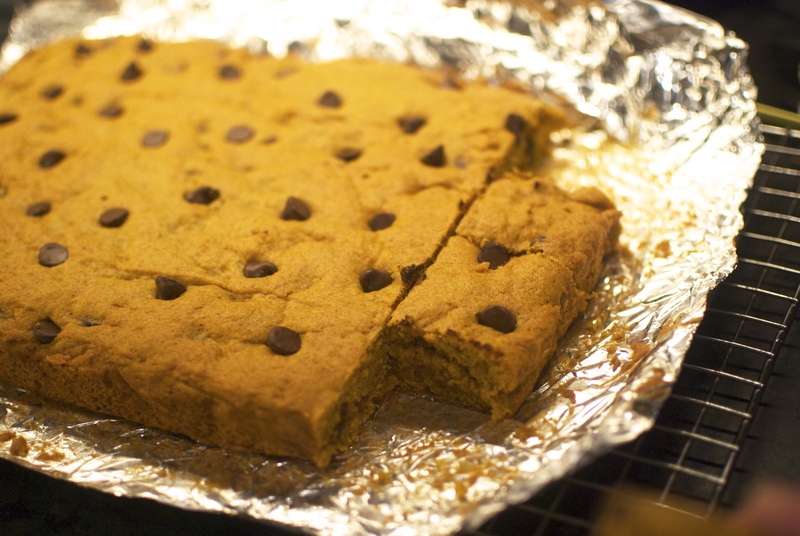 A few weeks ago I tried a recipe from caramelpotatoes.com for chocolate chip pumpkin blondies. 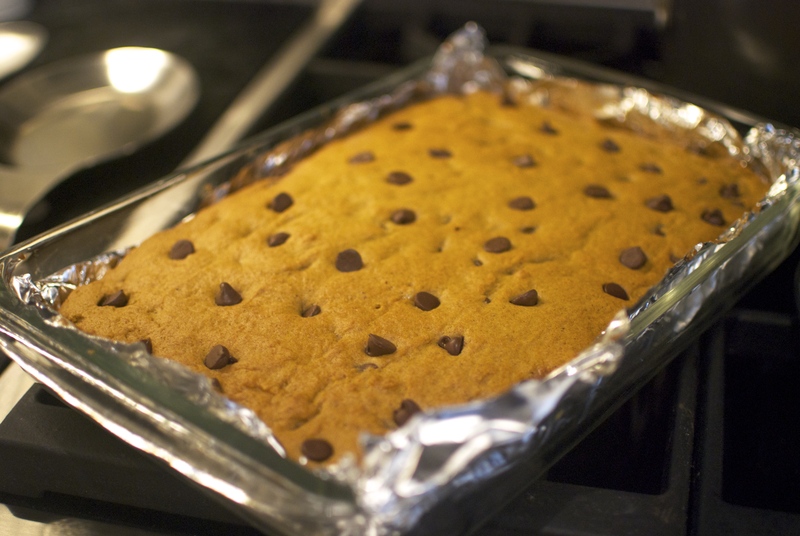 The result was perfect for children and adults alike, with just the right amount of pumpkin flavor and spices. The addition of chocolate makes the whole situation even better, as chocolate often does. 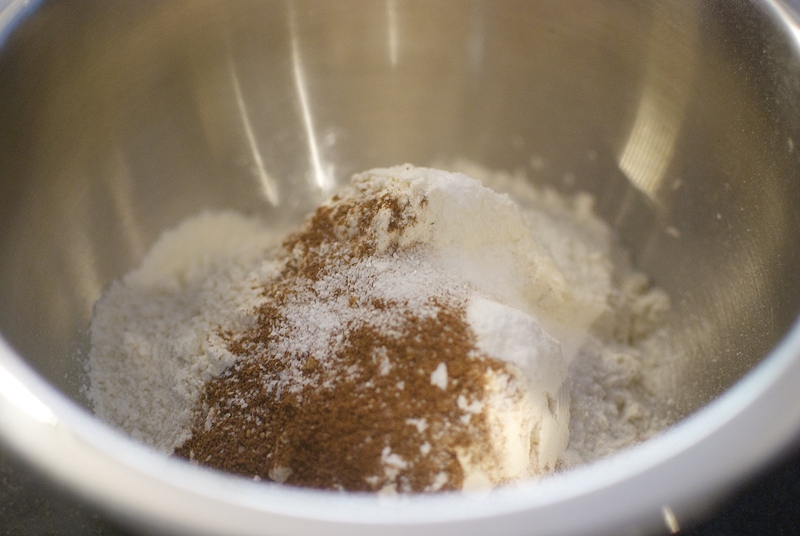 We’ll start with the dry ingredients: pumpkin pie spice (or your own mix of spices like allspice, cinnamon, nutmeg, ginger, and cloves), flour, salt, and baking soda. 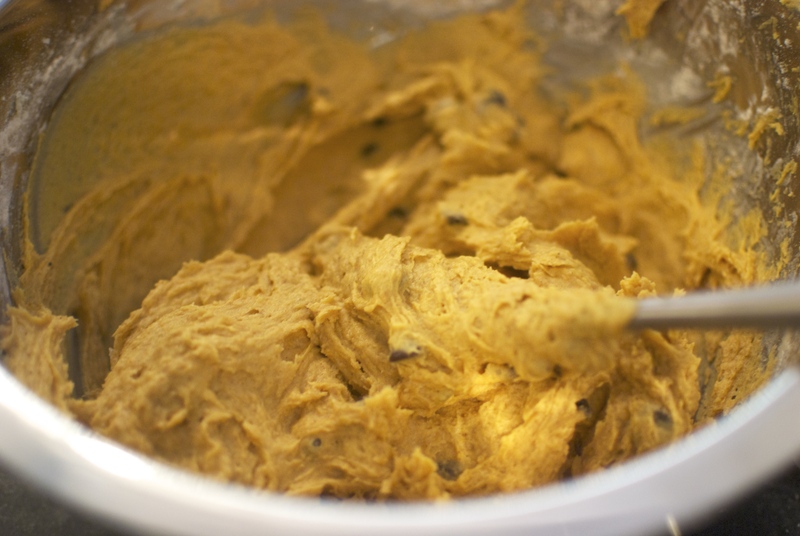 Give it a whisk and set the mixture aside. And then beat in an egg and some vanilla extract. 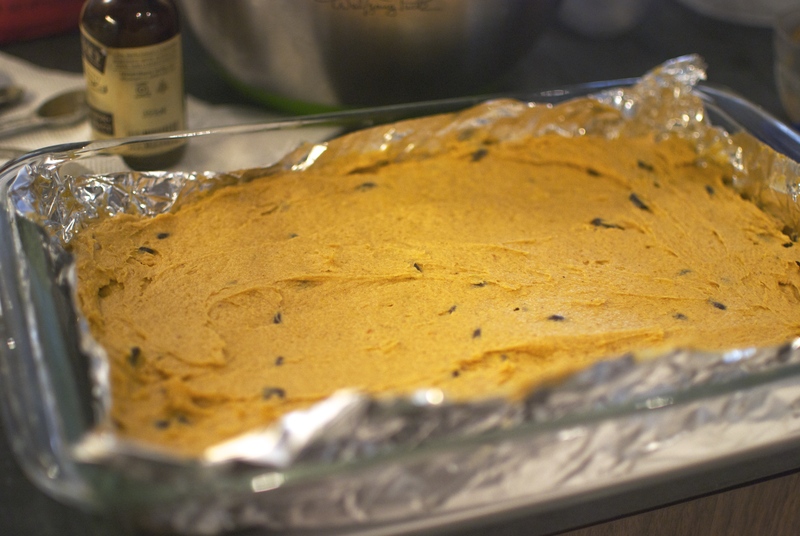 Now for the good stuff– the pumpkin! See? No more curdled weirdness! Let us rejoice. 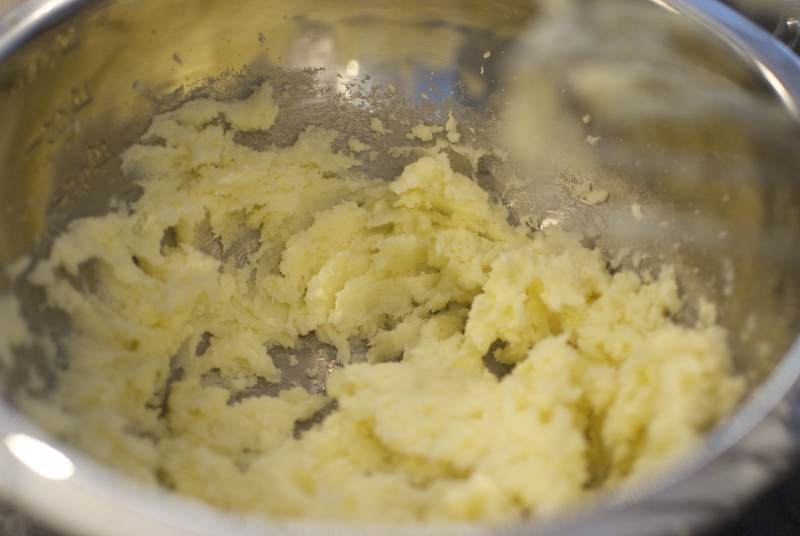 After you’ve taken a spoonful of batter (and lined a 9×13 inch pan with tin foil), pour the batter into your dish and spread it out so it bakes evenly. 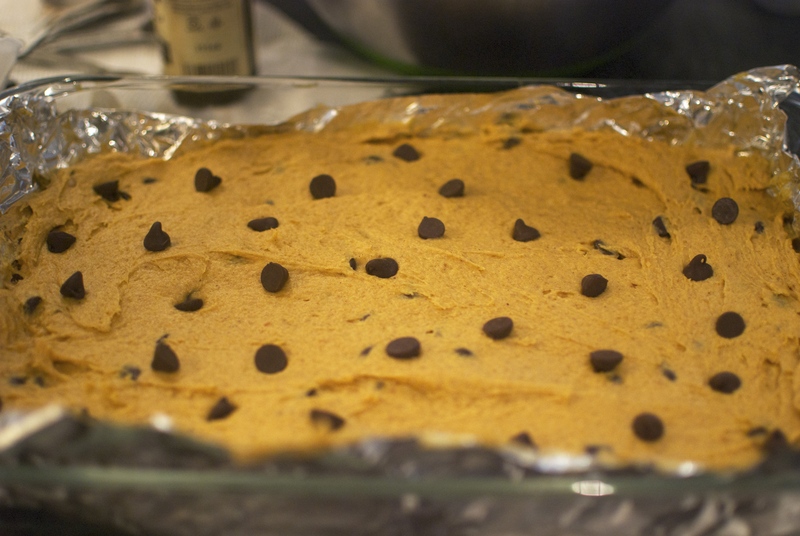 Go ahead and dot the top with chocolate chips, too! The more the merrier. Or until it looks like this! A toothpick should come out almost clean. 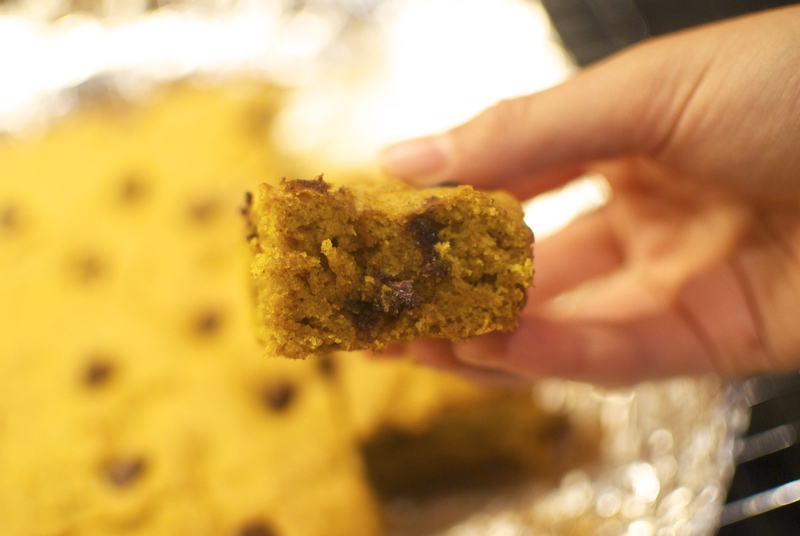 Once the blondies have cooled in the pan, carefully lift them out onto a rack using the tin foil. Cut into squares and dig in! 1. Preheat oven to 350 F and line a 9×13 inch pan with foil. 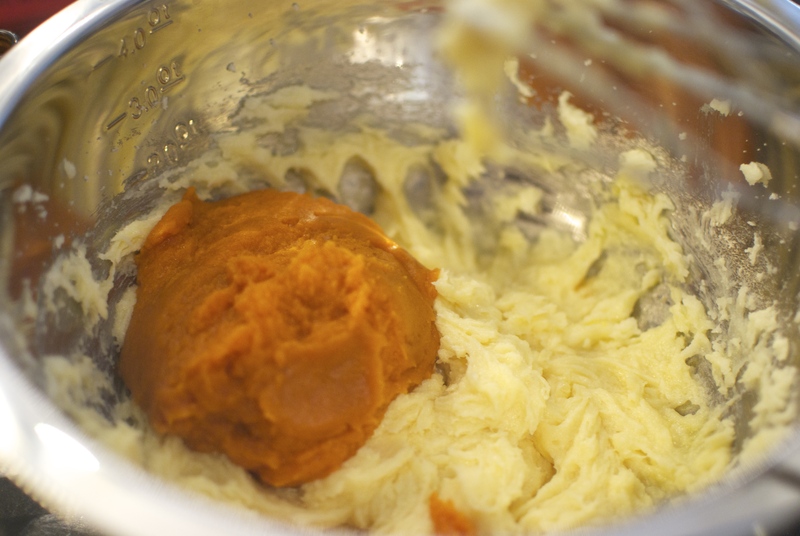 In a large bowl, combine pumpkin pie spice (or spice mixture), flour, salt, and baking soda. Set aside. 2. 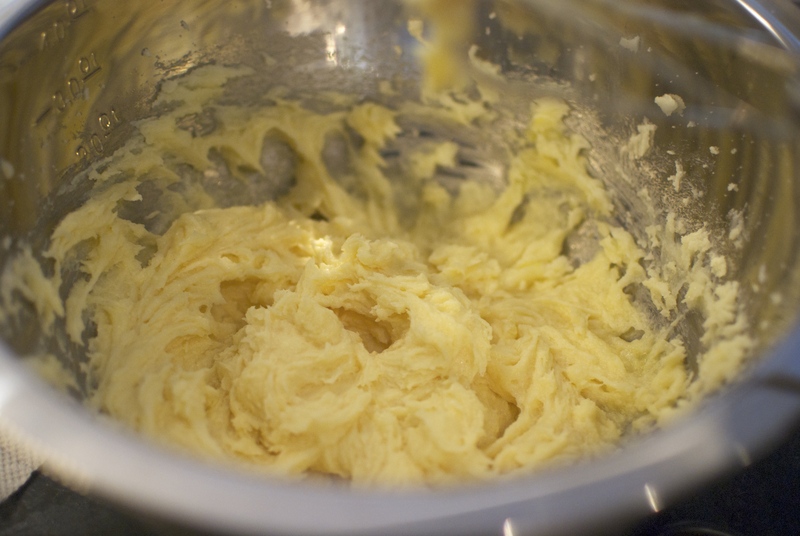 Cream butter and sugar in another large bowl. Beat in vanilla and the egg just until combined. 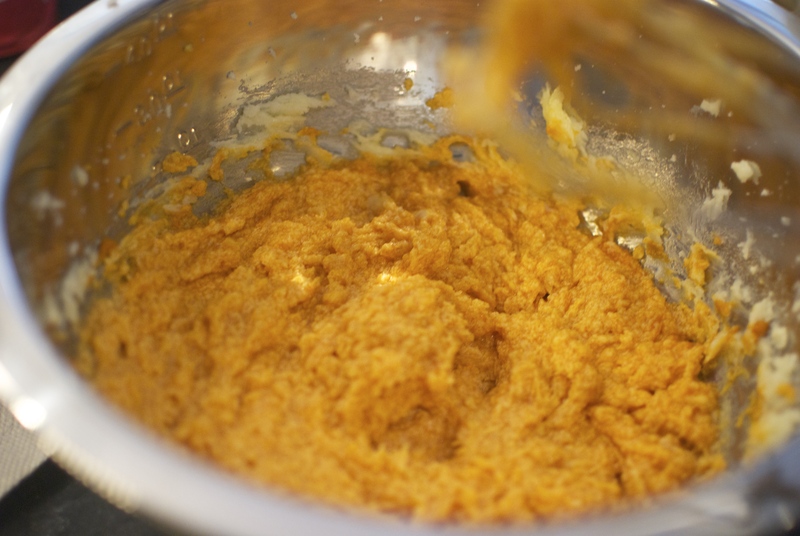 Beat in the pumpkin, then add the dry ingredients with the mixer on low. Stir in 1 cup (or desired amount) of chocolate chips. 3. Pour batter into the prepared pan and spread out with a spatula. 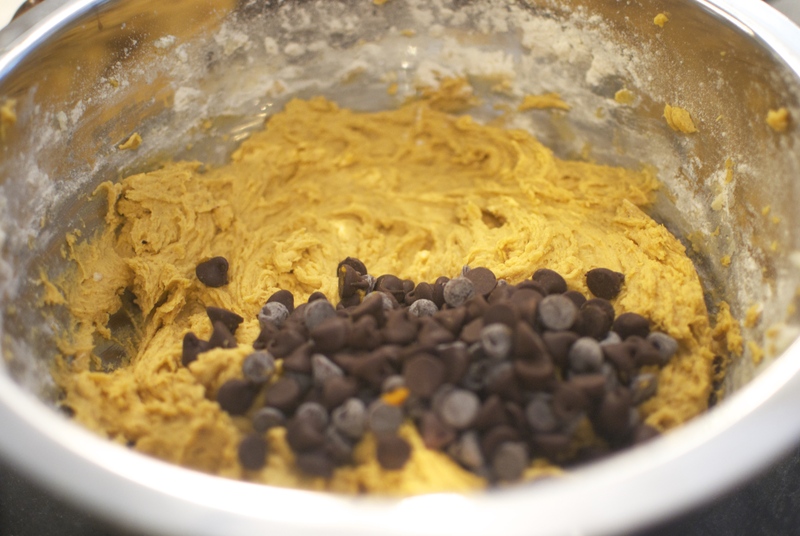 sprinkle the top with the remaining chocolate chips. 4. Bake for 30-35 minutes, or until a toothpick comes out with only a few crumbs. 5. Cool in pan completely before removing using the tin foil. Cut into squares and enjoy! I hope everyone is well and having a great holiday. Happy nibbling! As long as credit is given, we would love for you to feature us! Thanks so much, and have a happy Thanksgiving! How trendy is this polkadotted bake? Love it!